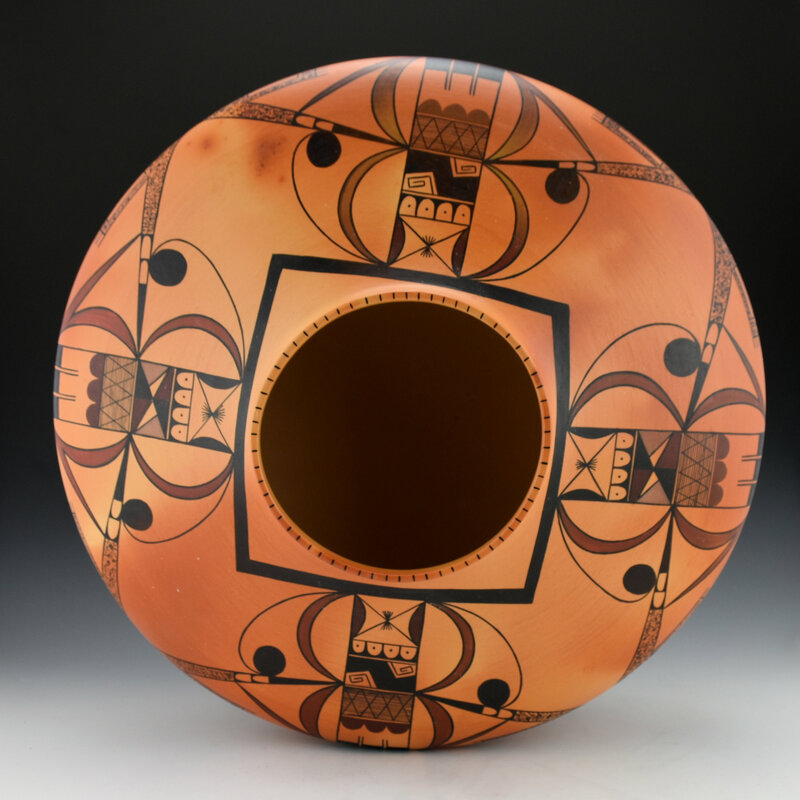 This is a striking very large wide shoulder jar by Mark Tahbo. 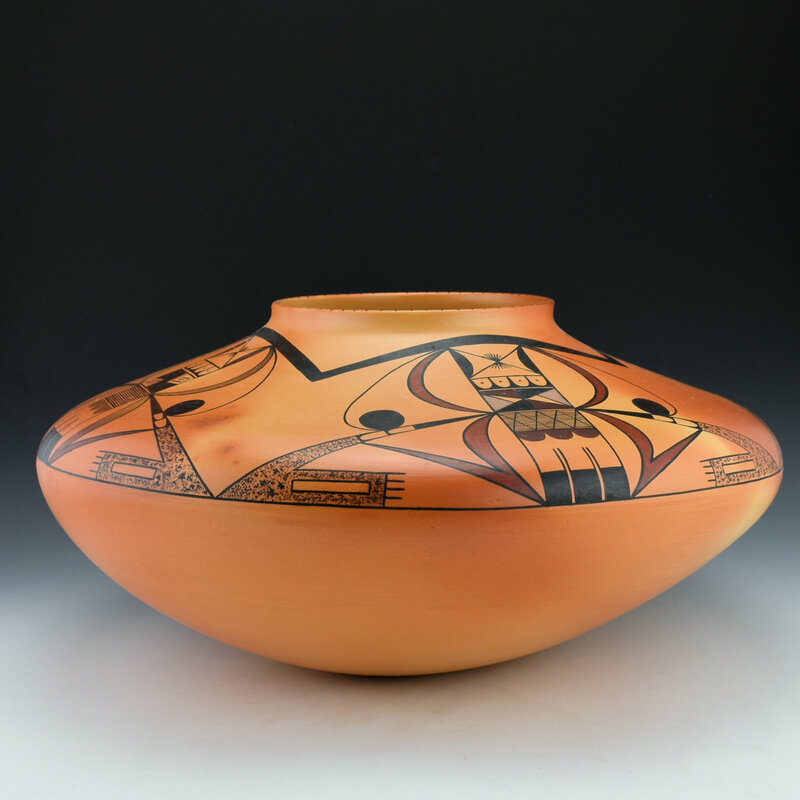 The jar is a classic Hopi or Sikytaki shape, with the wide shoulder and a slight neck. The neck is just slightly turned out, which for Mark, it was the little details in his pottery which were important to him. The shoulder of the jar is painted with an intricate eagle tail design. Mark would often try and stylize patterns so that they were not just a repetition of previous work. Here, the tail feathers can be seen in the center of the design, and then the wings extruding outward and mottled. The jar was painted with bee-weed (black) and then clay slips. Note that he used a deep red clay, but also a mauve clay slip in the center areas. 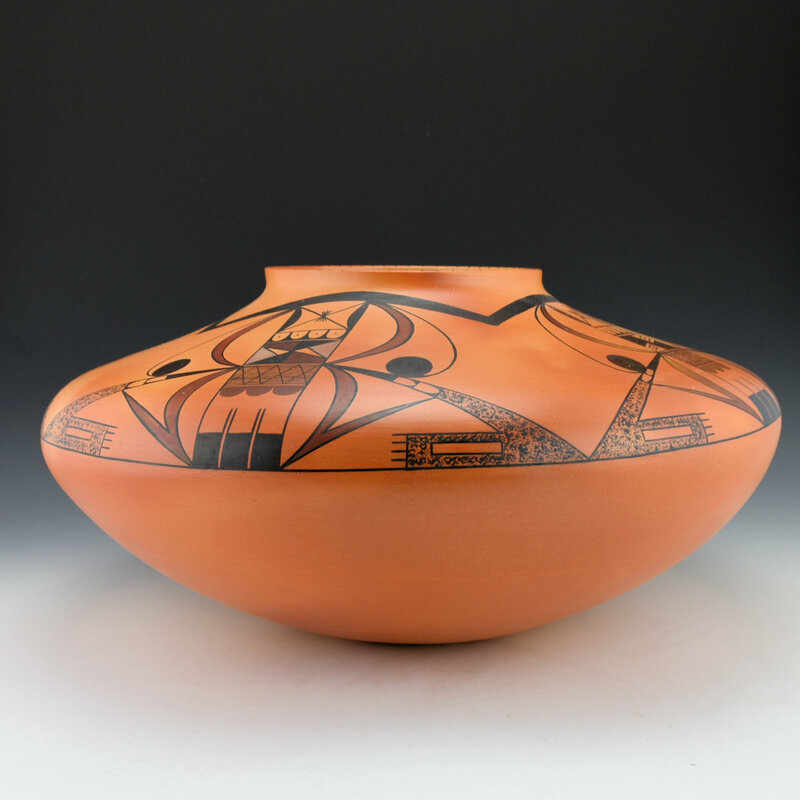 It was only around 1998-9 that he began to use the mauve clay, which he found near Hopi. It was difficult to use and he didn’t have much, so he used it as an accent in his designs. The jar is traditionally fired and the blushes are simply amazing! The color variations range from white to orange almost red! 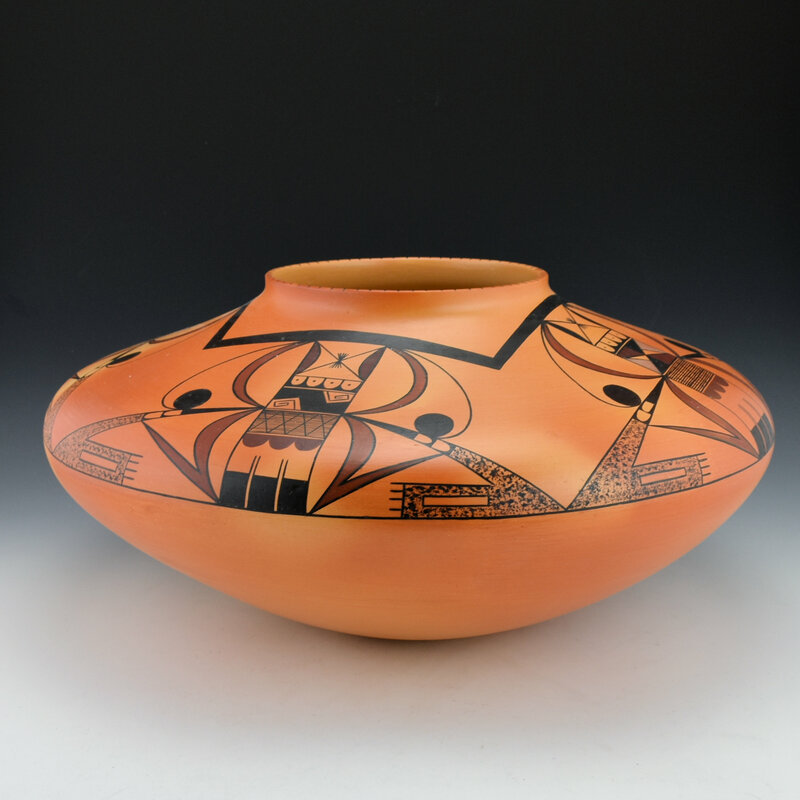 Mark worked diligently to create blushes on the surface of the pottery so that they would almost function as another design element! The jar is signed on the bottom, “Mark Tahbo” and dated ’99. The jar is in excellent condition with no chips, cracks, restoration or repair. The owners of the jar acquired it directly from Mark. 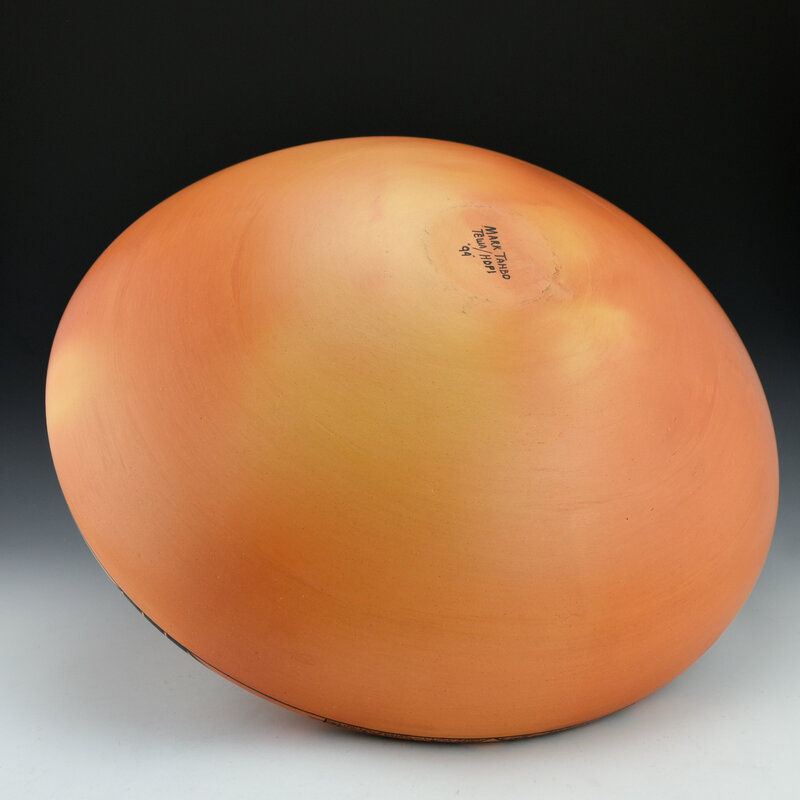 Finding pieces of his this size, design and coloration is a great testament to his skill as a potter and painter!